Do you have children in school? Perhaps there is a special teacher in your child’s life who deserves recognition and a special treat? 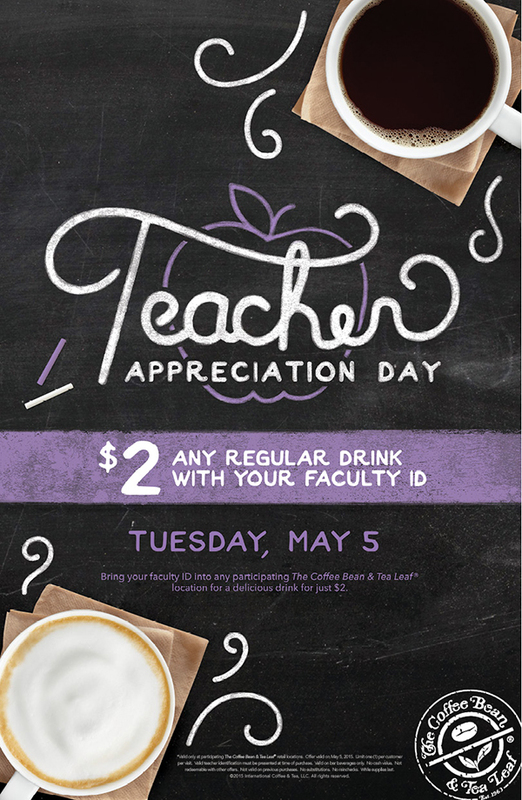 In celebration of National Teacher Appreciation Day (Tuesday, May 5, 2015), The Coffee Bean & Tea Leaf®, Southern California’s iconic specialty coffee and tea retailer, invites teachers and faculty members to present their school ID to receive any regular (16 oz.) beverage for only $2, to honor the work they do for their communities. How awesome is that?!! Available all day at participating Arizona, California, New York, Connecticut and Austin area store locations, teachers can order their favorite signature drink, or opt for the new seasonal Thai Tea and Vanilla Rooibos beverages. The promotion will take place at all participating The Coffee Bean & Tea Leaf® locations*. To locate the store closest to your area please visit: http://www.coffeebean.com/store/storelocator.aspx. Born and brewed in Southern California since 1963, The Coffee Bean & Tea Leaf is the oldest and largest privately-held specialty coffee and tea retailer in the United States. Embodying a passion for connecting loyal customers to one another with carefully handcrafted products, the company is known for sourcing and providing the finest ingredients and flavors from around the world. For more than 50 years, The Coffee Bean & Tea Leaf has demonstrated a passion for product innovation epitomized by The Original Ice Blended® drink. The company has grown to be an international icon and currently has nearly 1,000 stores in close to 30 countries.